Bakery cases come in a variety of functional and aesthetic styles, so finding the right one for your baked goods is a challenge. 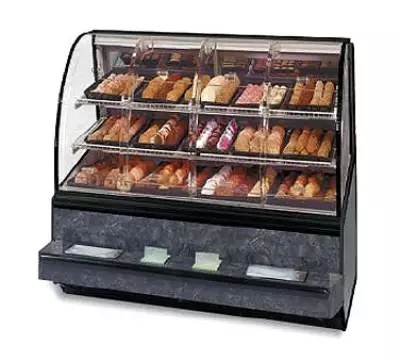 The variations are extensive – there are full-service and self-service models, refrigerated bakery cases and dry bakery display cases, straight glass and curved glass – and the benefits and drawbacks of each are not always clear. 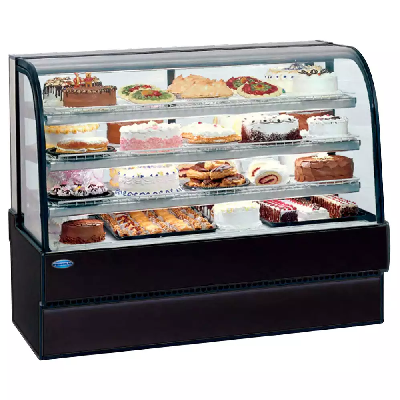 In this article, we'll explain the uses of each style of bakery case and help you choose the one that best suits your needs. 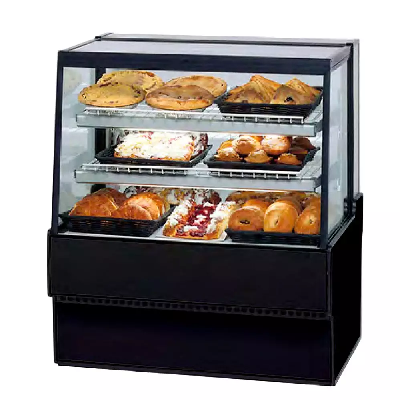 Bakery display cases are great for merchandising your baked goods, but do you need a refrigerated model? That depends on what you're baking. Non-perishable baked goods can be stored in a dry bakery display case without a problem, but baked goods based in dairy products or fresh fruit need to be refrigerated so they don't spoil and become unsafe to consume. These are just a few examples, and it is the operators' responsibility to determine which products need to be refrigerated and which don't. 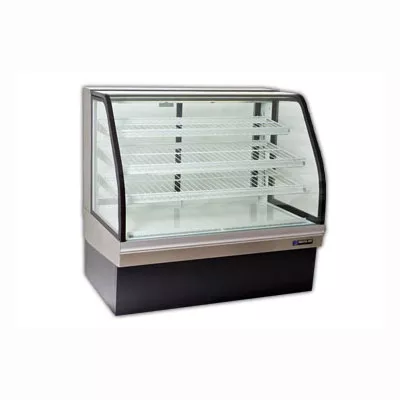 Both dry and refrigerated cases merchandise your baked goods to customers, but a refrigerated bakery case will need significantly more power than a dry case to provide a cool, safe environment for perishable goods. Dry cases can be used without a power outlet, but any lighting in the merchandiser won't work. If you plan on offering both perishable and non-perishable baked goods, consider choosing a dual-zone merchandiser. These cases provide both dry and refrigerated compartments in one unit, saving space and keeping your display compact. Full-service cases can only be opened from behind the counter, so the operator will have to dispense every purchase to the customer. Self-service cases can be opened from the customer side, so the consumer can grab the exact item he or she wants. We also carry dual-service models that offer a full-service section and self-service section. Operators need to present their carefully crafted goods in an attractive manner to generate maximum sales, and merchandisers help accomplish that goal. Display cases have either curved or straight glass fronts. Straight glass provides a classic look, while curved glass is more popular for modern establishments. Since both looks function very similarly, personal design preference is the most important differentiation. Some models have bottom hinges so operators can tilt the glass outward for easy cleaning, which aids in keeping the glass smudge-free and presenting products in the best light. Consider whether you want glass on the sides of the merchandiser. If you plan on sandwiching it between other equipment, there's no need to have glass on the sides, but if the merchandiser will be standing on its own, glass sides can add an elegant touch. Almost all merchandisers, dry or refrigerated, have lights inside them to aid in displaying your products. To take advantage of this, you will need a working outlet. These units usually use a standard 120 volt, but some of the larger refrigerated display cases may require more power than a standard outlet can provide. Check the individual product page before purchase to ensure you'll be able to power your machine.